Simple install, connects directly to your vehicle. Our most covert tracker works in any make model or year vehicle. Perfect for any vehicle, trucks, fleets or heavy machinery. Simple installation, connects directly to your vehicle. 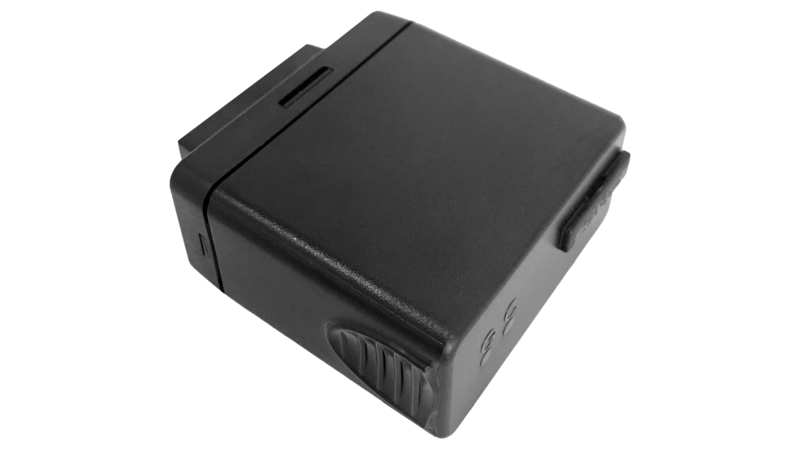 This covert vehicle tracker is easily hidden within the vehicle and works with any year, make and model vehicle. Perfect for any vehicle, and any size fleet, works with sedans, vans, trucks, and heavy machinery. Optional battery backup keeps tracking even if disconnected. MasTrack wired-in gps vehicle trackers are used by businesses tracking their vehicles and personnel to reduce fuel and travel costs, monitor equipment usage, verify employee time sheets and customer billing, and to minimize overtime and improve customer service. MasTrack wired GPS vehicle trackers are used by families to encourage driver safety and promote responsible driving habits. 24 x 7 unlimited hardwired car GPS tracking access gives peace of mind to parents keeping an eye on their teen drivers and families monitoring the location of an aging loved one. Once your installation is complete, your device will automatically start reporting every time the vehicle is switched on and will continue reporting based on your service plan. Simply log into the web portal and view live or historical tracking at any time. Access tracking from Computers, Smartphones, Tablets, or other web enabled devices. There is no limit on how often you can view your trips. 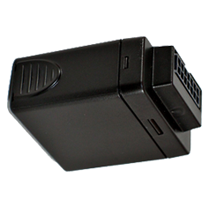 At MasTrack, we make using your hidden vehicle tracking device simple and easy to use. We know there is no one size fits all. So we give you the option to pick your own service plan, change plans or cancel at any time. The device can be set to alert you when the vehicle exceeds the posted speed limit of whatever road it is currently travelling on. The device tracks the rate of deceleration of the vehicle, a major indicator of aggressive driving, and alerts you when the vehicle exceeds a safe threshold. Another major indicator of aggressive driving, the device also tracks the rate of acceleration of the vehicle and alerts you when the vehicle exceeds a safe threshold. The device can be configured to alert you when the vehicle travels into, out of, or both in and out of a customizable area. This can be useful for tracking employees with specific locations they must visit, or a teen driver on their commute to and from school. Easily schedule maintenance reminders at regular intervals by either time passed or miles traveled for each vehicle. This feature makes it easy to keep on top of maintenance for both individual vehicles and fleets of any size. 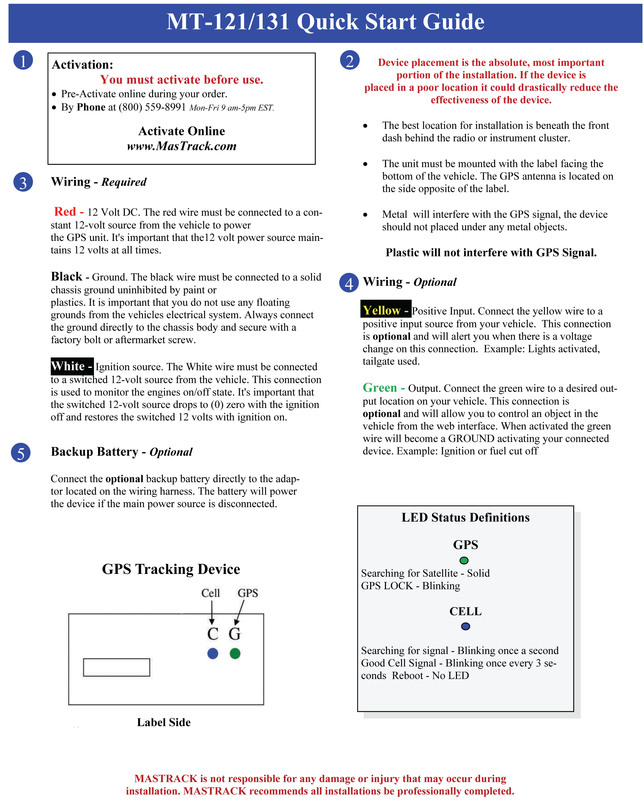 The device can be set to alert you whenever the vehicle is being towed, meaning that it is being moved while the ignition is off. The device can be configured to alert you when the vehicle has been left stationary with the ignition on, which can be expensive and wasteful. 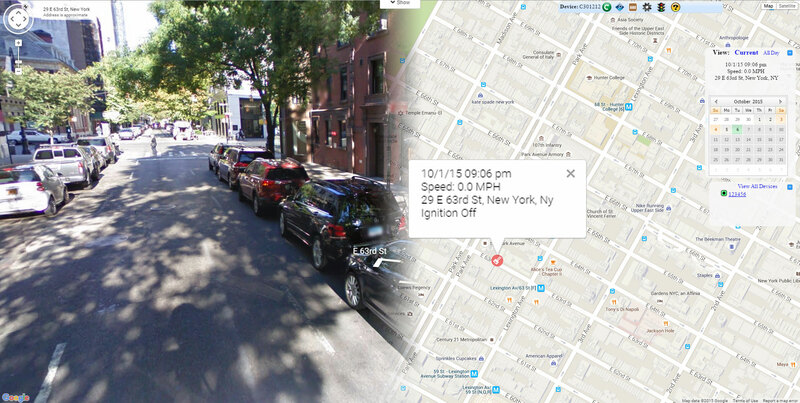 The device instantly tracks when the vehicle turns on and off. 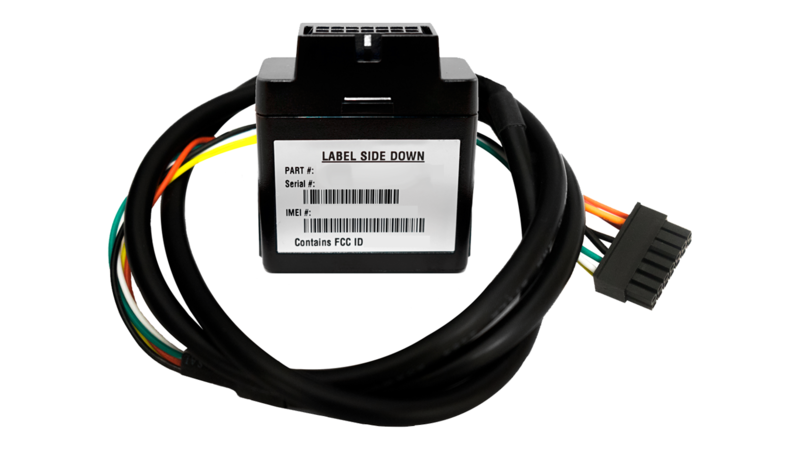 Activating this alert after connecting the yellow positive input wire to the desired system within your vehicle allows you to receive an alert whenever that system is used. 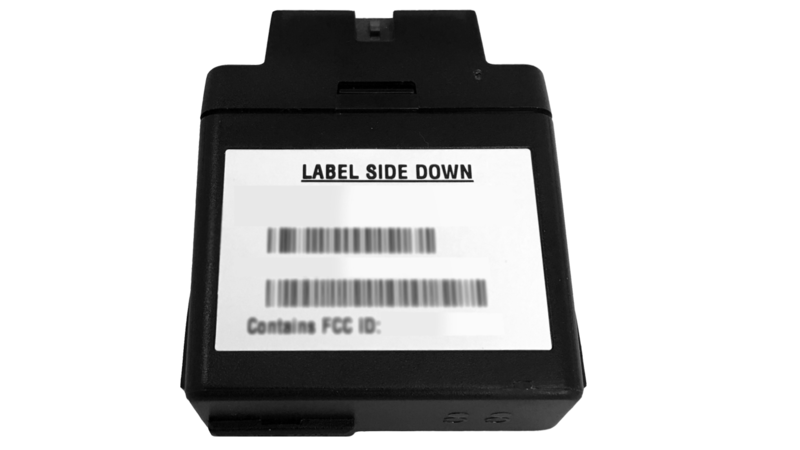 For example, this could be connected to the vehicle's tailgate to alert you whenever the tailgate is used. 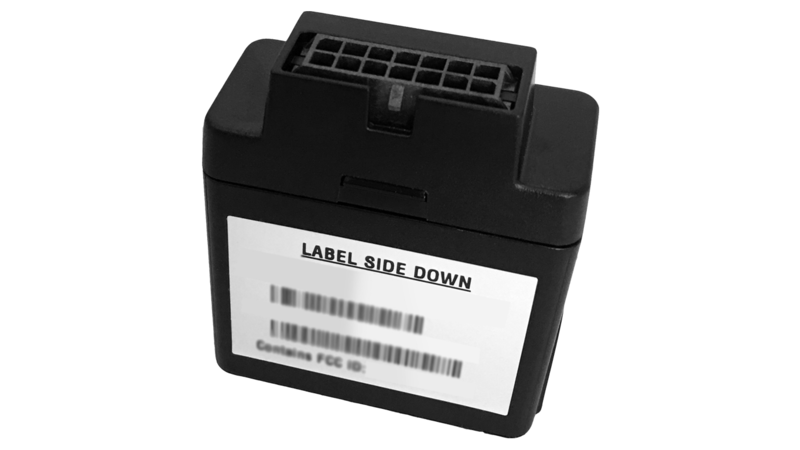 Activating this alert after connecting the green output wire to the desired system within your vehicle allows you to control an object or function within the vehicle. When the output feature is activated the green output wire becomes a ground.When connected to the appropriate relay this can trigger an action, for example an ignition or fuel cut-off so that the vehicle remains disabled. Supporting all the same great features that MasTrack has to offer, these units can be mounted hidden from view for extra protection. What networks do you operate on? The devices use the cellular networks to transmit data back to our servers. All the location are obtained using a minimum of 4 satellites . We offer service on AT&T, Verizon or T-Mobile. If you have a preference let us know when you make an order. There is no extra charge for any network. How hard it is to install the hardwire unit? By default the devices do not make any noise. Although silent by default, some devices are capable of buzzing to correct driver behavior. Contact customer support if you are interested in this feature. All devices have dim LEDs. You can cover them if needed and it will not impact service. 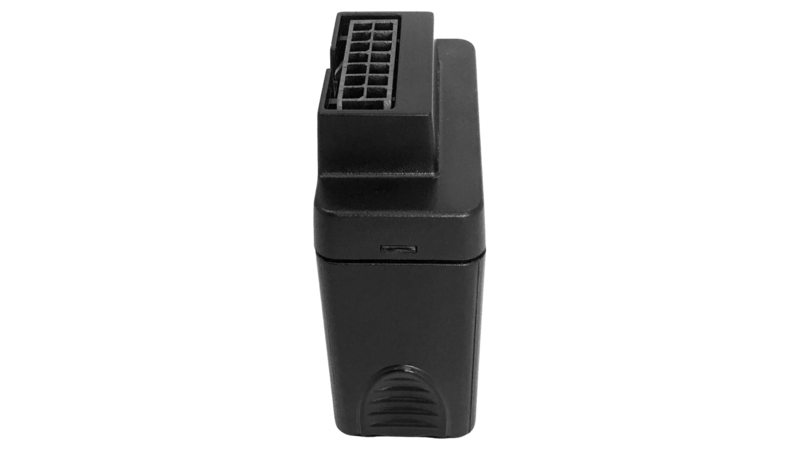 Upgrade to a battery back-up Hardwired device for continuous reporting even if the main power source is disconnected. Standard Hardwired device with simple 3-wire install.